I build a small number of guitars each year. I design each one with a specific concept or theme in mind, sometimes in collaboration with the customer. The aim is to create guitars with strong personalities bound up in the appearance, materials, sound and feel. Desirable alternatives to the ubiquitous production-line F's M's and G's. 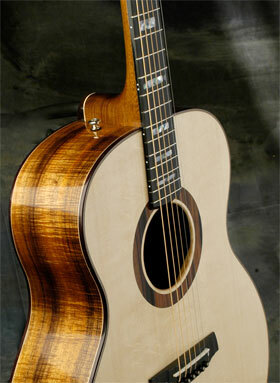 If you're a player with a few guitars under your belt, there comes a time when you lust for a guitar that is special. Yours. It's the one where everything is how you like it... maybe just that little extra fretboard width to accommodate your fat fingertips... or that honky flash of gold and abalone... that shape and colour that you just can't get off the shelf. This is what I do. I work with the fine Australian tonewoods such as Blackwood & Bunya as well as Exotics and the more traditional instrument timbers such as Spruce, Maple, Rosewood and Ebony, I also utilise the power of modern composite materials such as Carbon Fibre, Kevlar, Titanium where appropriate. For example you have the option of traditional Truss rod neck or a 'space age' Carbon spar neck. Some of my acoustic guitars feature a Carbon reinforced fibreglass soundchamber body which gives a super-clean crisp bright tone. My acoustics feature neck/body joints using a modern, efficient mortised joint bolt-on method. Electric Necks can be Set-neck, Bolt-on, or Screw on.Generally the style of guitar (Fender or Gibson style) dictates this, But the advantage of a custom built instrument is that you can mix and blend these sort of design/construction features. For example some of my Fender style guitars feature a sweet smooth carved blend or a classical 'recurve' heel instead of the standard 'back-step' neck joint). 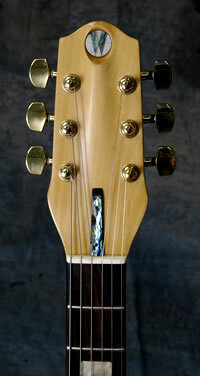 My bolt-on neck features a properly engineered arrangement with Steel Socket-head bolts engaging into brass captive nuts set solidly into the neck. You may know what an off-the- shelf 'F' or 'G' costs. Not bad guitars, but ooh you're paying a lot for those those headstock decals! Whittaker Guitars pricing starts in that ballpark. -And you'll know that there will never be another one the same. You get the opportunity to collaborate in the design to get the instrument you've always wanted. And you get an instrument that is designed and built with utmost care, using beautiful materials. I also handle custom modifications, refinishing, restorations, custom paint jobs, Inlay work, set-ups, and repair jobs, -especially those difficult ones that most guitar techs avoid.